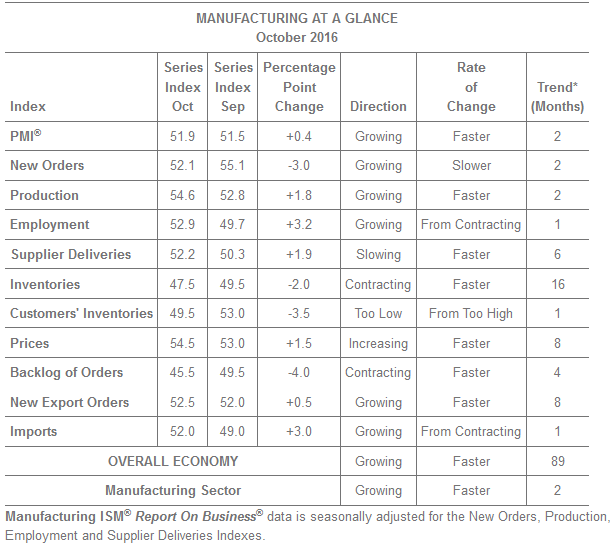 What is the ISM Manufacturing PMI Indicator? The Institute for Supply Management (ISM) releases a monthly economic report known as the ISM manufacturing Purchase Manager Index (PMI). The ISM manufacturing PMI for short is one of the leading economic indicators which give an early glimpse into the health of the manufacturing sector in the US. The ISM was formerly known as National Association of Purchasing Management (NAPM). The ISM has been conducting its survey since the end of World War II. In this article, you will learn what the ISM manufacturing PMI report is, what the components of the report are, how to read the ISM manufacturing PMI report and how it affects the markets. What is the ISM manufacturing PMI report? The ISM manufacturing PMI is an economic indicator that reports the economic health of the manufacturing sector in the US. The complete name of the report is Manufacturing ISM® Report On Business® survey. The PMI is based on a survey conducted by the Institute for Supply Management (ISM) nationwide. The report covers 23 different sectors in the manufacturing industry such as Apparel, Textile Mills, and Transportation Equipment and so on. The ISM manufacturing PMI is a forecasting tool and is attractive to economists due to its timeliness. What better way to gauge the health of the economy than to go directly to the heart of the issue? That is what the ISM manufacturing PMI does. However, despite its timeliness, the ISM manufacturing PMI does have its drawbacks. Any economic shocks incurred during the second half of the month is not covered because the survey is typically conducted during the first part of the month. Any economic shocks are reflected only in the next month’s survey report. However, such occurrences are usually rare, and it is an issue that plagues most of the economic releases as well. The ISM manufacturing PMI is also unique because unlike government surveys and statistics, the report is not subject to large revisions, except annual updates on seasonal adjustments. When is the ISM manufacturing PMI report released? The report is released during the first week of the month and covers information for the previous month. For the latest ISM manufacturing PMI release schedule, visit this link. An important distinction that many tend to miss out is that the ISM manufacturing PMI is a diffusion index. A diffusion index or a dynamic factor is used in statistics (obviously) is a method to summarise the common tendency of a group of statistics series. If there are more numbers in the series that are rising, the index moves above 50 and falls below 50 if there is a greater number in the series that are declining. Simply put, the diffusion index measures the percentage of advancing versus declining series in the statistical group. What are the components of the ISM manufacturing PMI report? To understand the components of the ISM manufacturing PMI, one should first know what is in the survey. Executives are simply asked to report on each of the components whether they are higher (better), lower (worse) or same as (no change) from the previous month. Based on the survey responses, the PMI index is based on a level of 50 and is a composite index and is based on the diffusion index of the five of the indexes mentioned below, each with its weighting. An ISM report that is above 50 typically indicates that the manufacturing sector is in a positive outlook or expanding, which is good for the economy while an ISM reading below 50 indicates contraction. According to the ISM, the following factors are to be kept in mind. The distance from 50% or 43.2% indicates the strength of the expansion or decline. So far we have learned what the ISM manufacturing PMI is, who conducts and publishes these surveys and what information is contained in the survey. In the next section, we explain how the ISM manufacturing PMI report looks like and how to read and understand the report. How to read and interpret the ISM Manufacturing PMI Report? The ISM manufacturing PMI report is very detailed. At the outset, the most important number to look at is the PMI number followed by the headline statement as shown in the picture below. What follows next is a brief summary giving details on the expansion or contract period and other statistical data such as the current PMI reading is above or below from the previous month as well as a similar report on the five sub-indexes. The report goes into more detail and gives an outlook on the 18 manufacturing industries noting whether these sectors report growth, contraction and no change. 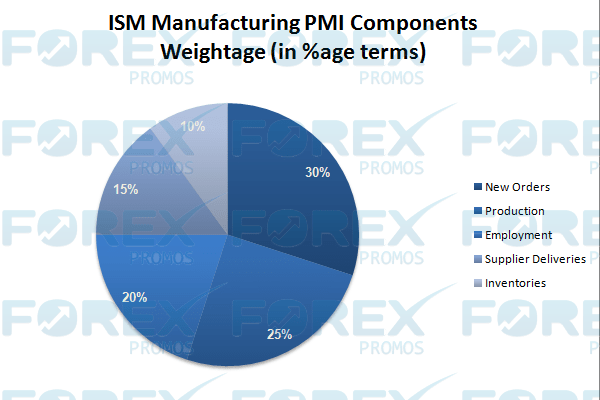 The ISM manufacturing PMI report also gives a brief summary of views or opinions from the respondents from each of the sectors and gives a detailed breakdown. The ISM manufacturing PMI report then goes into further detail for each of the sub-indexes highlighting how the individual index has performed and the outlook for the same. While the ISM manufacturing PMI makes for an interesting read if you are a fan of economics, for traders it is the headline print that matters and the growth outlook. How do markets react to the ISM Manufacturing PMI Report? Needless to say, the ISM’s manufacturing PMI report influences stocks, bonds and currencies. The US dollar is susceptible to the ISM manufacturing PMI survey as it gives an early glimpse into the health of the economy, which in turn influences interest rate decisions from the Federal Reserve. A healthy ISM manufacturing PMI often bodes well for the US dollar and the US equity markets, while a weak or a negative report tends to see the bond markets appreciate in a risk aversion mode. 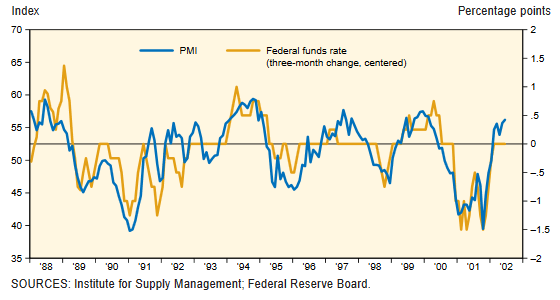 The chart below shows a historical correlation between the ISM PMI and the Fed’s monetary policy decisions. In conclusion, the ISM’s Manufacturing PMI survey is an economic indicator that every trader and investor should pay attention to. While at times the survey is susceptible to short-term discrepancies in the report, a broader consideration of the survey gives a glimpse into the future course of the economic cycle. The ISM manufacturing PMI is a report that is not viewed just by traders or investors but is also watched the US Federal Reserve, thus making it a valuable tool that traders must pay attention to. Here’s a brief summary from this article. The ISM manufacturing index is based on a survey of 400 purchase managers in the US, across 20 industries.